I’m sitting here at the Michael Landon Center in Malibu, and it’s mid-afternoon. And I was noticing how, lately, and today also, I’ve been feeling so very tired in the afternoons. And so I thought I would sit down and absorb the energy that’s around me in the air … just sit in the Sun, and allow the energy that’s around me in the natural world, to just ‘fill in’ my body. And what I found, in about 10 minutes, was that I felt completely refreshed. I’m wishing you all well: Lots of light, very expanded bodies of Light, very expanded DNA, cosmic mind up above the head, and ‘mud galoshes’ on your feet, so that you keep your grounding in reality. Talk to you later. 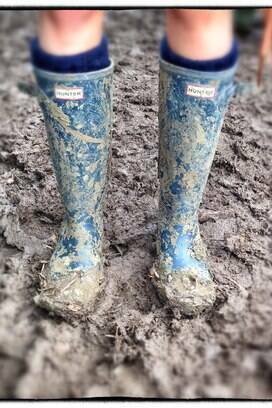 Image: Muddy Galoshes, http://i0.statig.com.br/bancodeimagens/56/z5/19/56z519qyblkh4lno8yxn4l02u.jpg .. This entry was posted in 06 – Monasic body / Higher mind body (Cosmic mind), Ascension symptoms, Grounding - earthing, Physical DNA – genetics and tagged Ascension symptoms, cosmic mind, DNA, grounding, Michael Landon Community Center, nature, tiredness on 26 February 2018 by Alice B. Clagett.